Topic 1: How can we increase student engagement with our events and activities? The main focus of encouraging student engagement was through promotion through academics and using social media inventively to learn more about an upcoming event. There was also a focus on events being contextualised to help students understand key benefits of attending. Through discussion within this topic it was apparent that many of the suggestions given by the groups regarding preparation and promotion of an event already happen (e.g. videos to help prepare for networking events, workshops on skills development, and various promotional activity). However, a key element was student awareness and how this could be improved. In regards to increasing student engagement, the group felt that engaging freshers was still an important step, even though they have a large amount of information to intake. It was suggested that there be an events calendar given in induction, which students could use in their halls of residence or bedrooms to give usefulness to promotional material and thus feel more engaged. Engagement before university was also a topic of discussion, either through email on registration or something included in admission packs, which are already sent. This could encourage engagement very early in the student experience. Academic support for the events and activities within lectures was a popular and strong opinion by the focus group. Students felt that the engagement of academics helped to give validation to events and that many more students would be aware of events and engaged to attend if their academic gave weight to promotion. Student Ambassadors who were dedicated to promoting events and activities in CES who could visit lectures to see more students in person was something that students felt would help engagement. Learning from other students was something students felt was useful and meant that more students could hear about events, when CES resource is limited. The group also felt that including students in events would help engagement. This could be done in a number of ways: musicians for networking events, Ambassadors helping on the day (already happening) and even events students helping out with the organisation (SF explained that this has been explored). Students felt that having mini taster events would help students becoming more engaged with larger events. For example, a mini Flux held in curriculum could help promote and encourage students taking part in the wider competition. If not in curriculum it may be a good idea to have FLUX mini briefings to help people meet other people to compete with (if they had no one in their course or friendship group to compete with). There could also be briefings for mock interview sessions on how to prepare and for the creative CV completion, CV taster sessions with examples of previous entries. 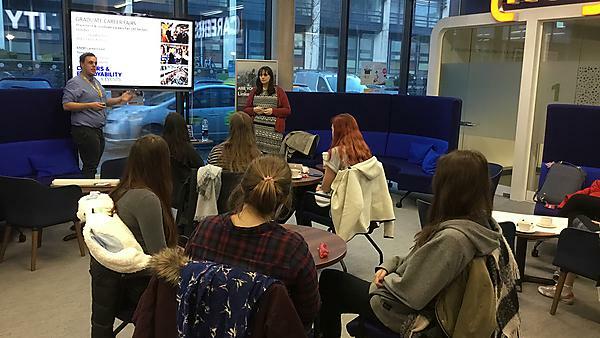 Students said that careers advisers were also important in promoting events, with one student saying that they were quite disengaged with careers information, but in a compulsory lecture (attendance monitored) where FLUX was promoted for STEM they felt inspired to take part with friends. Another student said that they knew some final year students did not know what they wanted to do, so they did not turn up to lectures. Another student said some students did not turn up to their careers lecture as it had been similar each year. Promotion in core lectures was where students felt there could be the best engagement for promotion. Students felt that catering to all students so they did not feel excluded would be beneficial in engagement. Where events are inclusive, but not clearly marketed this way, students felt that it should be clearer how students could benefit from attending the event. SF and RBS noted that they do run workshops and have videos they help students understand the benefit of events, but from the comments, more promotion would be beneficial. Students also felt that short employer videos from employers who were attending the careers fair, so that students could learn more before attending to meet them. Academic support for the events and activities. Student Ambassadors who are dedicated to promoting events and activities. Including students in events would help engagement. Mini taster events to help introduce students to new events. Promotional videos from employers to help engagement with careers fairs. Incentives – vouchers, prizes or experiences to be won for attending and for these to be promoted after the event when someone is chosen. Facebook group (rather than just a page). Promotional banner on DLE pages.